After we’ve begged and begged, five incredible Asian inspired flavours have just launched in Australia. 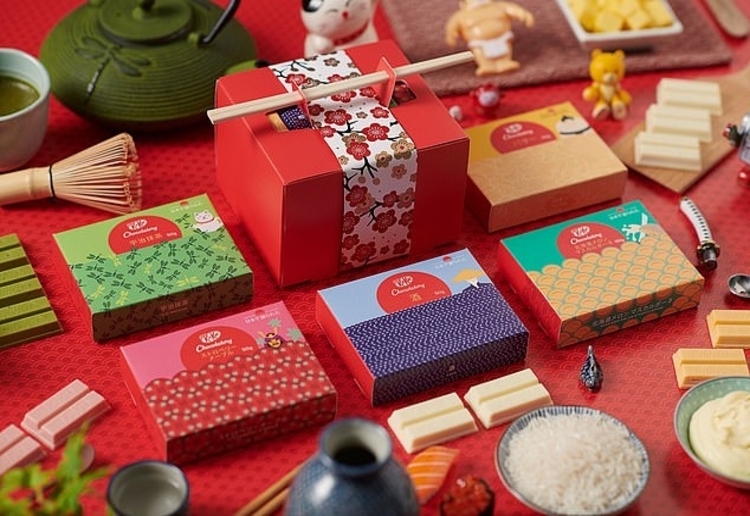 Butter, Sake, Uji Matcha, Strawberry & Maple, Hokkaido Melon…they sound like ingredients at a luxury restaurant, but KitKat have just imported these five new taste sensations from Japan as part of their ‘Created in Japan’ range. They won’t be available at your local servo though – exclusive to the KitKat Chocalatory shop in Melbourne, these products can be bought in-store or online for pickup only The Daily Mail reports. As if the ever reliable KitKat could get any better, the new range responds to a growing demand for new and interesting flavours. Available for $8 per 69g bar, the company anticipates Butter to be the biggest success, closely followed by Sake which contains a small amount of the popular rice wine making it one for the adults! Choosing just five flavours for the range provided a challenge. “It was a hard decision to make – there are over 300 unique creations available in Japan – but we landed upon delicious combinations that we believe will excite Aussie chocolate lovers,” Connie said. Available right up until Christmas, there is talk of new flavours being added to the range in the future. “Keep your eyes peeled for what’s next because we are always innovating and will have lots more exciting flavour combinations launching soon,” she said. As if we needed another excuse to buy chocolate at Christmas, or any time of the year for that matter! The humble KitKat has been an enduring household favourite though, so we’re sure this incredible range will be a total hit. Which flavour of the ‘Created in Japan’ range would you choose? Tell us in the comments. None. I prefer the classic kit kat. Oh I have tried the matcha flavour, it’s delicious and I am excited. I find it interesting the need to create new flavours. I will always revert back to the original. Tim Tams… so many flavours and I’ve tried many, but I always go back to the original. Kit Kats, the same. Why do we need to offer so many choices. I imagine it’s an expensive exercise. Does not appeal to me. If not for the high price I may have tried them though. A friend of mine has given me both Kitkat in Uji Matcha and Red Bean (Adzuki) flavours. I still prefer Red Bean over Uji Matcha, for some unexplained reason. Have not tried Butter, Sake , Strawberry & Maple Syrup yet, but Hokkaido Melon was delicious and a bit tad too sweet for me. Please bring in the Red Bean flavours next. These flavours do not appeal to me – a basic Kit Kat with a cup of tea is for me! The flavours sound interesting but not my thing. I would choose Hokkaido Melon. I love the hokkaido cheese tarts and think the hokkaido melon would be fresh and tasty. Strawberry and maple would be my pick but I’ll have to plan a trip to Melbourne first. Have had strawberry KitKat but not with maple added but I love both so yummo I say. My son bought a heap of KitKats back home from Japan …The only one I did not like was the sake. The matcha kitkat was really nice and he also bought back proper special matcha tea. I have tried the Uji Matcha and the Hokkaido Melon when I was in Japan last year. I have also tried starwberry but not the Strawberry & Maple. But if I was to choose one it would be the Hikkaidi Melon because I love the flavour so much. not sure if butter kit kat would go down well!